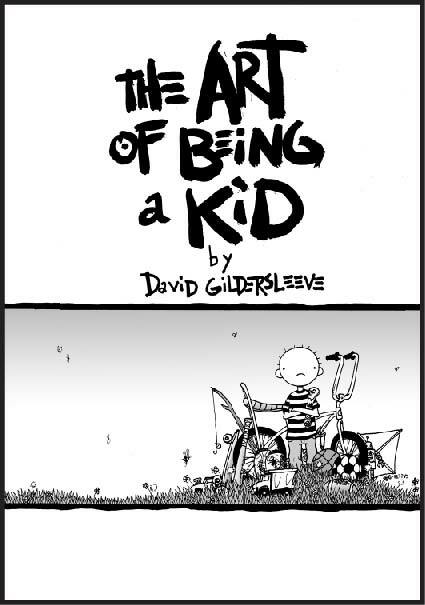 "The Art of Being a Kid"
Home > G-sleeve Art > "Books" by David > "The Art of Being a Kid"
A Book for the Young at Heart - "The Art of Being a Kid"
"The Art of Being a Kid" is a book inspired back when the author and his wife learned they were going to have a son. David decided to create an illustrated guide for his son on how to be a kid, based on his own experiences, using a simple style that his young son could follow. It turns out that more people than just his son enjoyed these single-page vignettes on growing up. Click on image to enlarge it. His wife, Samantha, seeing how people responded to David’s illustrations, made prints of these recollections from his youth to sell in galleries displaying his art. They became immediate best-sellers! Now here they are — a collection of 80 vignettes that follow our hero through a year of being a kid — all the adventures and funny moments that prove we are all connected through the magic of being children. 96 Pages, 7" x 10"